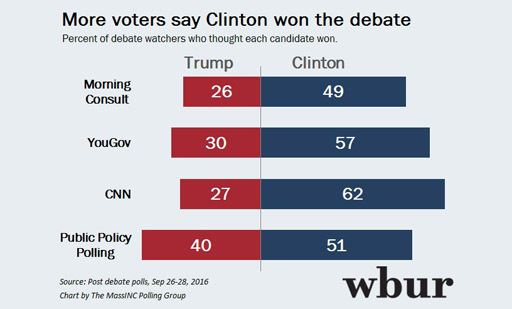 According to a newly released poll conducted by NBC News/SurveyMonkey, 52% of respondents say Democrat Hillary Clinton won the first presidential debate this past Monday night over Republican Donald Trump. Just 21% said Trump came out on top. Within her own party, Clinton strengthened her base among Democrats and Democrat-leaning voters view her with 50% saying their opinion of her changed for the better. Only 26% of Republican and Republican-leaning voters felt Trump improved his standing among them. When it comes to all-important Independent voters, two-thirds of those polled said their opinion of the two candidates did not change as a result of the debate. Sixteen percent said Clinton improved in their view, while 9% said the same about Trump. In terms of "appearing presidential," 53% of respondents said Clinton has the proper temperament to serve as president effectively, while 63% said Trump does not. As noted by Chuck Todd this afternoon while reporting on these results, this survey is an actual scientific poll, as opposed to a "widget" or "instant poll" on a website trolls can vote, refresh, and vote again. While Trump boasted about how he won several of those easily freeped online voting widgets, several scientific polls now show Clinton won the night.